A Tesco store has asked customers not to shop in their pyjamas or barefoot. Notices have been put up in the chain's supermarket in St Mellons in Cardiff saying: "Footwear must be worn at all times and no nightwear is permitted." A spokesman said Tesco did not have a strict dress code but it did not want people shopping in their nightwear in case it offended other customers. He said he was not aware of any other Tesco stores having to put up similar signs. The signs are placed at the entrance to the store, on the city's outskirts. They read: "To avoid causing offence or embarrassment to others we ask that our customers are appropriately dressed when visiting our store (footwear must be worn at all times and no nightwear is permitted)." The sign in Tesco asking people to get dressed before doing their shopping is as depressing as the ones you see in the Post Office stating that staff won't tolerate abusive behaviour. In a civilised society these things shouldn't need to be said. The spokesman said: "We're not a nightclub with a strict dress code, and jeans and trainers are of course more than welcome. "We do, however, request that customers do not shop in their PJs or nightgowns. "This is to avoid causing offence or embarrassment to others." Elaine Carmody, 24, a full-time mother of two young boys, described the ban as "ridiculous" and "pathetic". She said she had regularly gone shopping at the store in her pyjamas until about a week ago when she was turned away when she went to buy cigarettes. She said she had been "popping in for a pack of fags," but if she had been doing a full shop "then we obviously would have gone in clothed". "But we only wanted fags and they still refused us to go in for a pack of cigarettes," she added. Ms Carmody, who spoke after spending £102 in the supermarket, added: "If you're allowed to wear jogging bottoms, why aren't you allowed to wear pyjamas in there? That's what I don't understand. 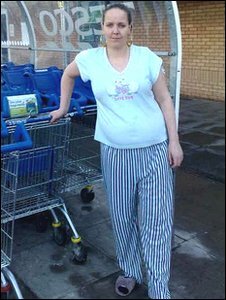 "I think it's stupid really not being allowed in the supermarket with pyjamas on. "It's not as if they're going to fall down or anything like that. They should be happy because you're going to spend all that money." She went on: "It's not as if you're making a show. If anything, they should be happy because you're spending your money in their shop, but obviously they're not, because you're not allowed in with pyjamas. "So they're going to lose their custom, with people going to other shops to buy stuff and they're allowed in with their pyjamas on."